XUZHOU, China, May 28, 2018 /PRNewswire/ — XCMG, the world’s leading construction machinery manufacturer, is providing equipment for BHP’s major iron ore mining site in Pilbara, Australia. The win comes as the company continues its growth among key markets along China’s “Belt and Road” Initiative (B&RI), including infrastructure and mining projects in Cambodia, Azerbaijan, and Malaysia. XCMG has delivered GR3505 motor graders to BHP’s site in Pilbara, one of the company’s five world-class iron mines in the region which have an annual production of 275 million tons. BHP chose the GR3505, which XCMG has upgraded to meet BHP and Australia’s mining equipment standards, for its acclaimed maneuverability, functionality, efficiency and safety standards. XCMG has also sent a team of technicians to provide on-site equipment service in Pilbara, guaranteeing a prompt response to any problems. XCMG is the only road machinery supplier for the project to rehabilitate Cambodia’s National Road 11, a 96.48-kilometer-long road and key of the highway network in central Cambodia. XCMG maintains the largest share of Cambodia’s road machinery market. XCMG has delivered 34 pieces of hoisting equipment to assist a harbor project in Azerbaijan, including all-terrain cranes, skid steer loaders and reach stackers. A team of six technicians provided 30-day service to support onsite equipment installation, testing and training. XCMG’s cranes are servicing Malaysia’s east coast railway construction, the largest single project along the B&RI. XCMG is a multinational heavy machinery manufacturing company with a history of 74 years. 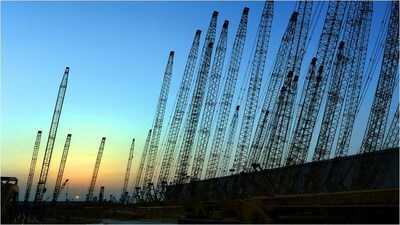 It currently ranks sixth in the world’s construction machinery industry. The company exports to more than 177 countries and regions around the world.